GAMBIT AF-400 gasket sheet is based on Kevlar® aramide fibres, mineral fibres, and fillers bound with NBR rubber based binder.GAMBIT AF-400 gasket sheets are high parameter sheets, made of top quality materials. Highly reliable, with broad range of applications. 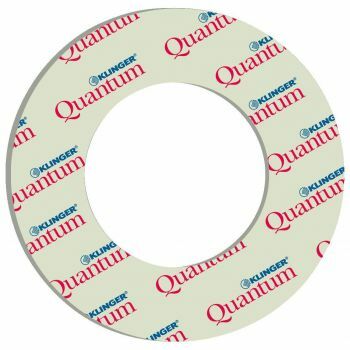 Designed for use in supervised joints, and installations for transmission of ..
GAMBIT AF-1000 gasket sheet: Used in high temperature flange joints, in systems with high fluctuations in pressure and medium flow rate. Features high mechanical resistance. Can be used in automotive industry. It is not recommended with acids and bases. When working with steam use suitable mounting clamps. Water, steam, kerosene, gasoline, fue..
GAMBIT AF-200G: A high parameter sheet, containing special combination of aramide fibres and graphite. The sheet features high elasticity. 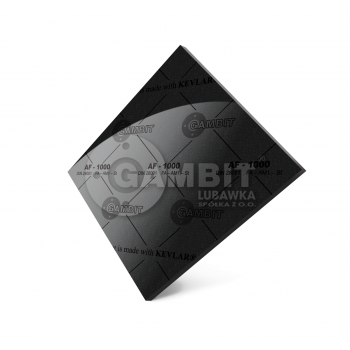 Recommended for applications with steam, water, fuel, and oil resistant, among others.Gasket sheet GAMBIT AF-200G is based on Kevlar ® aramide fibres, mineral fibres, and fillers bound with NBR rubber-based..
GAMBITGRAF LUX®: Applied in high temperature and pressure. Recommended to steam, carbohydrates and most of chemical compounds except strong oxidants. GAMBITGRAF LUX® gasket sheets are resistant to mechanical and thermal cycles as well as to rapid changes of temperature.GAMBITGRAF LUX® is made of 99.5% pure expanded graphite foil, rei..
Gasket sheets KLINGER® top-graph2000This is really flexible graphite sealing material with a high degree of inherent stability offers reliability in handling. 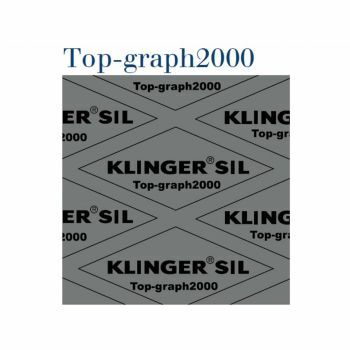 Thanks to its high load bearing capacity and the low embrittlement, KLINGERtop-graph-2000 is ideally suited for use with steam and other sophisticated applications.The material impresses..
novaform® SK - The high pressure gasket material for extreme mechanical applications, such as in exhaust pipes or exhaust turbochargers. 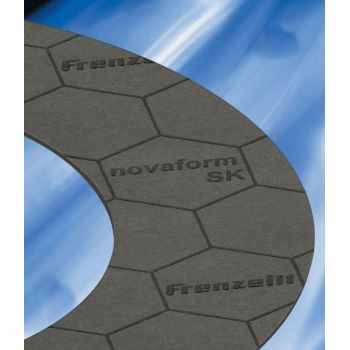 The matrix of aramid fibres, NBR binder and special agents is reinforced with a galvanised steel wire insert made from a zig-zag construction (1.0314).Application areasnovaform® SK is the ideal choice f..
novamica THERMEX is the gasket material with extremely high temperature stability. 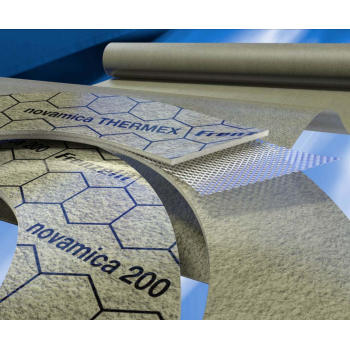 It is based on processed phlogopite mica and thus resists to continuous temperatures of up to 1000 degr C.Thanks to expanded metal insertion from stainless steel (AISI 316L/ 1.4404) the novamica THERMEX offers excellent handling and processing characteristics. 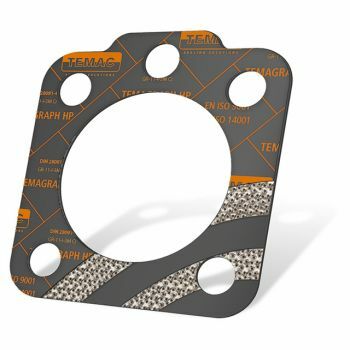 ..
Novaphit 400 is an efficient, flat metal-reinforced graphite gasket made from high-quality pure graphite that is reinforced with an acid-resistant stainless steel insert for many different applications in OEM operations and process industry. 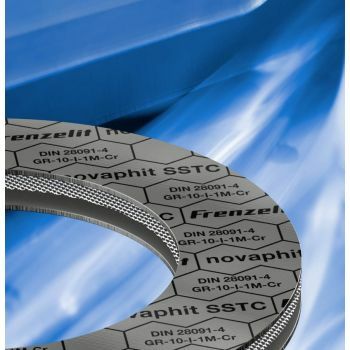 Novaphit 400 is, on the other hand, extremely simple and effective processing, even in the case of thin gask..
novaphit SSTC is a graphite gasket material with an insert of acid-proof stainless steel (1.4404, AISI 316 L) for the highest pressure and temperature requirements. 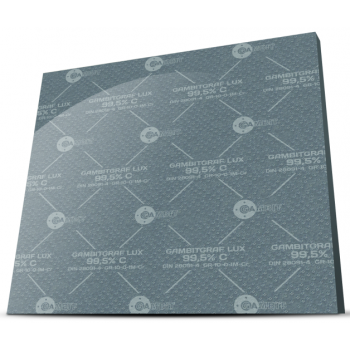 An excellent media resistance and the safety aspect, even in applications with changing loads, make this material superior. 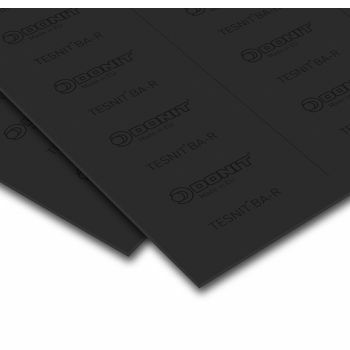 The expanded metal layer, due to its three-dimensional, non-i..
Temagraph Fi is a reinforced jointing sheet manufactured from pure graphite with one ore more glued flat stainless insertions which are bonded using a chloride-free adhesive layer. 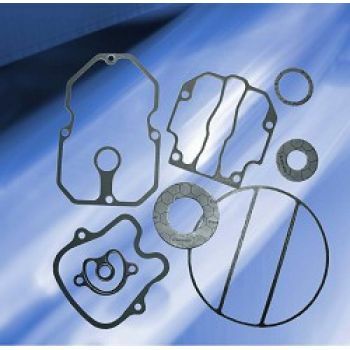 The scope of applications for Temagraph Fi gasket sheets includes high service pressures and temperatures including steam and therefore, it..
Temagraph HP is high integrity, multilayer sheet material with outstanding mechanical strength. It is designed for higher pressure and temperature applications and for flange connections where resistance to high bolt loading is required. 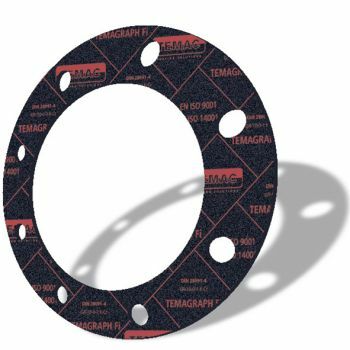 Temagraph HP is manufactured from the purity expanded graphite foil reinforced with a number of perforated steel..